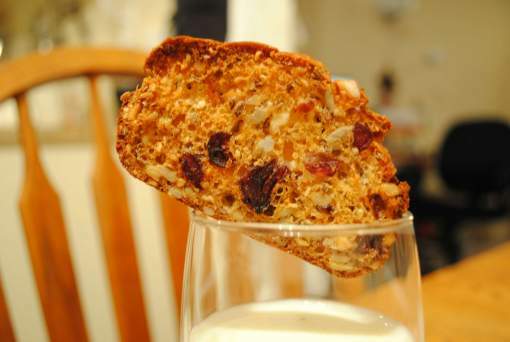 This recipe from Kitchen Friend Wai Chan uses your one cup of Amish Friendship Bread starter to make a great appetizer or healthy and nutty treat. 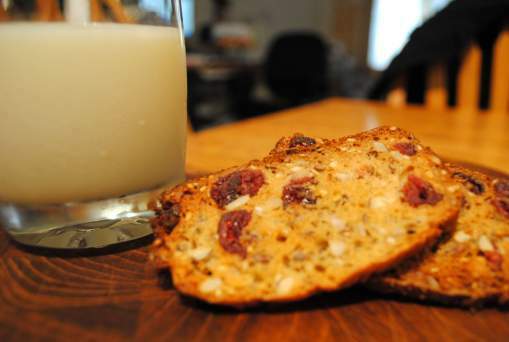 These cranberry and hazelnut raincoat Amish Friendship Bread crisps make a great appetizer or healthy and nutty treat. Stir in the starter, buttermilk and honey. Add in the remainder of the ingredients and stir until just blended. Grease two 8 x 4 loaf pans. Bake for about 35 minutes, until golden and springy to touch. Remove from pans and cool on wire rack. The cooler the bread, the easier to slice really thin (leave it till the next day or pop it into the freezer for partial freeze). Slice the loaves as thin as you can and place them in a single layer on an ungreased sheet. Reduce oven to 300° F (148° C). Bake slices for about 15 minutes, then flip them over and bake for an addition 10 minutes, until they become crisp and deep golden. Use a sharp, serrated knife works to slice the loaf. The end product definitely looks rustic and not necessarily neat and pretty but they taste amazing! For the perfect appetizer, serve with a dab of sweet red pepper jelly, or some soft creamy cheese. This recipe looks so yummy~ I love these crackers and I cannot wait to make them! The only place I can buy them is at whole foods and we don’t have a store where I live ,so I buy them when we visit our daughter. They also cost 8 or 9 dollars per box-pricey!– so if I can make these – yippee! These sound marvelous, much like a biscotti. Can’t wait to try them – going to run up to Whole Foods now and buy some hazelnuts and flax seed. The photo appears to be comparing a cracker to a toasted slice of this bread. After reading this recipe, though, I’m thinking I’m going to try spreading out the batter on parchment lined sheet trays. May have to add a crispening agent. I so want to make this for both halves of my family, my sister and and her boys and our best friend and her family!